These models of the Battle of Hastings and the Bayeux tapestry were built in 2016 by Jimmy Clinch and James Pegrum. During the night of the 4th January 1066 Edward the Confessor, King of England, died. Just before Christmas 1065 he'd suffered a series of ‘maladies of the brain’ and was confined to his bed. He had probably suffered what we now commonly call a stroke. He left no direct descendants. In fact his subjects joked that he was too pious to give his wife a child. Later that very day the Council of the Witan met to choose their new king. There were six contenders to the crown, none of whom could meet all of the criteria normally required from a king. The closest Saxon relative to Edward was his nephew Edgar. Unfortunately he was a young boy and his appointment was likely to be seen only as an invasion opportunity to his Viking step relatives watching across the seas. Instead the Witan chose Harold Godwineson. Harold was related to the King through marriage twice. The strongest link being that his sister Edith was Edward's queen, but that did not really make him of royal blood. But Harold was Saxon and had acclaim as a warrior having successfully led Edward's army in Wales. Together with his brothers, his family were the most powerful land owners in the kingdom. The Witan were prepared to overlook the tenuous blood link and he was crowed that very day. On hearing of Harold's coronation William, Duke of Normandy was livid. Two years before Harold had been in Normandy and according to William had sworn an oath on sacred relics to support William's claim to the English throne. This was blasphemy and treachery. William had been at war nearly all his adult life. Inheriting his father's title at a young age, he had fought hard to retain it. His determination was such that by August he had acquired a navy, obtained the papal blessing for his cause and even gathered former rivals he'd been at war with onto his side. William assembled his army near Caen, and boarded the ships. It was a hundred miles to the nearest point of England, but William did not get that far. The first southerly wind for a month quickly turned into a fierce westerly and William found his fleet blown back to the French coast and dumped on the beach at St Valery. Here William cursed his luck for the wind remained unfavourable to him for another month. He could not risk a winter sea crossing and time was running out. While the wind was unfavourable for William in the Channel, it was in exactly the right direction for those coming across the North sea. 4th January - The Death of Edward. William waits in St Valery. Harold's brother Tostig had already led a feeble failed uprising earlier in the year, but was now back with a formidable ally, Harold Hardrada, 'The Thunderbolt of the North' had campaigned in Russia and Constantinople, before returning in the 1040's to make himself King of Norway. It seems likely that his support of Tostig's claim was merely a convenient excuse to conquer England for himself. He was certainly the more formidable warrior of the two and ever the opportunist. They brought a fleet of between 200 and 500 ships via Shetland, Orkney and the east coast of Scotland to the mouth of the Humber and then set their sights on York. 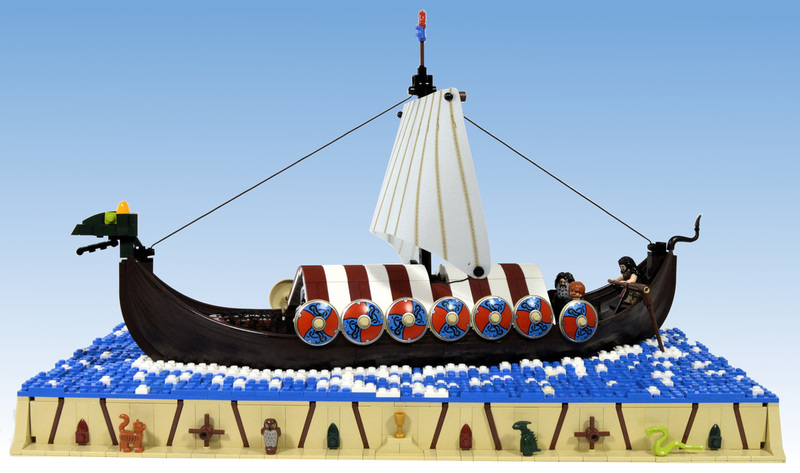 York received the 8,000 strong Viking army favourably, probably because they had little choice. A meeting was arranged at Stamford Bridge for the exchange of hostages to seal the deal. On the morning of the 25th September Tostig and Hardrada waited at the bridge ,their army was reported to be lightly armoured and so maybe not expecting trouble. Instead they met Harold Godwineson's Royal Army. On hearing of the Viking landings, Harold had marched his army 200 miles north in a week and sprung his trap. 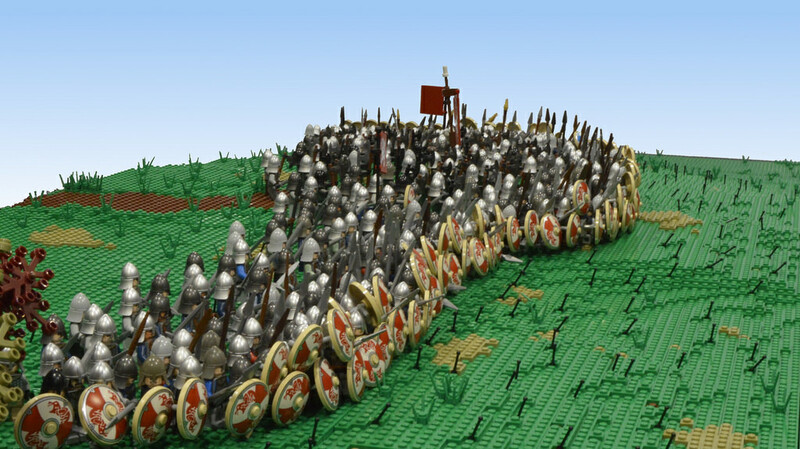 The Saxon Chronicle recorded fierce fighting, with a particularly large Viking warrior holding the bridge against all comers for a large part of the morning. It took one plucky Englishman sneaking under the bridge to spear the Viking from underneath and then the slaughter of Hardrada's army began. Just as Harold Godwineson must have been starting to relax, news reached him of William’s landing in Pevensey Bay a few days before. Harold could have waited for William to come to him, but instead opted again for a fast march to catch the enemy by surprise. Possibly aiming to trap William down by the coast and stop him pillaging the English countryside for winter supplies. The view up to the Saxon shield wall. Our Battle of Hastings and Bayeux tapestry builds were on display at the Rheged Centre in Penrith between 7th July and 4th September 2016. The model is still available for rent, contact us for more information.